Even though we officially went back to school today (without taking any cute pictures), it’s still technically summer. The temperatures are warm, the days long and now I’m just waiting for the crowds to clear out after Labor Day to make another “field trip” to the beach. 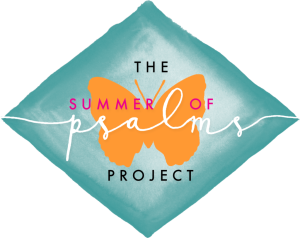 I’m happy to keep the summertime celebration going by participating in the Summer of Psalms Project spearheaded by Kristen at Vine of Plenty. I was so excited when she asked me to participate because her goal of creating beautiful hand-lettered printables of various bloggers favorite psalms ties in nicely with my love of free hand-lettered artwork. Did I mention she’s created a beautiful free printable for me to share with y’all?? Click to download this image as a pdf! I must be honest. When first approached, I didn’t have a favorite psalm I could rattle off the top of my head. I have several favorite passages that mention destroying enemies in various ways, but they didn’t quite seem like something most women would want to hang on their walls. You have given me the strength of a wild bull, you have poured rich oil upon me. My eyes look with glee on my wicked enemies, my ears delight in the fall of my foes. Oo! Or another good one! Now God will strike you down, leave you crushed forever, Pluck you from your tent, uproot you from the land of the living. So, after consulting with the hubs, I came across Psalms 127:1, which is familiar to me because I read it during Vespers from my Little Office of the Blessed Virgin Mary. It reminds me of the parable of the man who built his house on the sand. Today, as much as any time, our lives need a strong spiritual foundation. We can build a life filled with material possessions and notoriety, but it is as fragile as the house on the sand or the unprotected city. Without a foundation of truth, we are susceptible to an attack from sin and temptation that can potentially ruin our souls for eternity. In this day and age we need strength to do the right thing; a type of strength that we do not possess on our own. This psalm, in only a few lines reminds me to keep my priorities straight, and to order my life in a way that insures future stability by doing the right thing today. I don’t skip Mass or postpone Confession until the future. I do it now because those graces insure I can make better decisions in the future. I don’t neglect prayers with the kids until some unknown time “later” because I’m tired or grumpy. I do it now, with God’s assistance, to help myself and my children through the day and beyond. I can always make a million excuses and continue doing frivolous things that need to get done, but ultimately I am laboring in vain. We are constantly building and improving whether we realize it or not. Everyday, we add something to our marriage, our children’s hearts and minds, our friendships, etc. We can weaken these relationships with the sands of vice or build them strong with the stones of virtue. If we choose to weaken these bonds, we shouldn’t be surprised when they collapse. It’s an ongoing struggle. We can’t ever get lax in our efforts and assume that because we did something before or avoided a certain temptation once, it won’t rear it’s ugly head again. So long as we guard our souls and those of our family, the Lord has got our back with divine reinforcements. But once we start thinking, we’ve done enough, it’s good enough or we carelessly outsource our duties without oversight, we risk cracking the foundation we’ve worked so hard to build. So it’s a brief yet gentle reminder that my work is never done. Is that too heavy a sentiment to hang on my dining room wall? Perhaps it will at least encourage interesting dinner conversation. 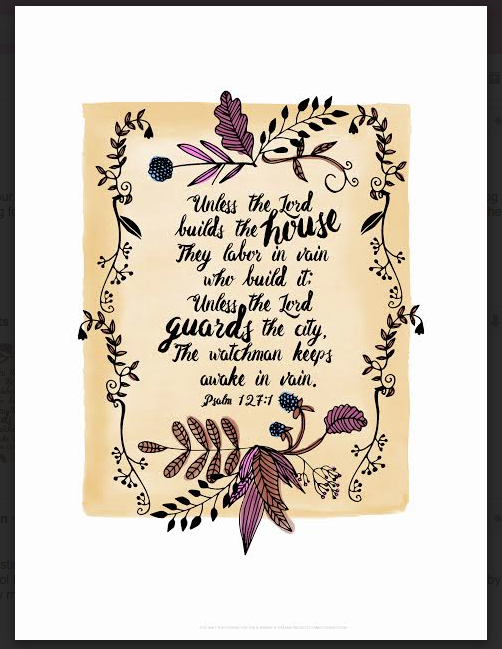 Be sure to check out all the Summer of Psalms printables over at Vine of Plenty. I’m thinking about getting a fancy clipboard to hang on the wall so I can rotate through some of the designs. Let me know your favorite psalm below and whether or not you would like to discuss my selection over dinner and fine wine some time. Lovely post and beautiful print! My favorite of many psalm passages is Ps 30:5 ~ (though weeping endures the night; joy cometh in the morning). Given my name I had it quoted to me so many times I decided to embrace it and take it to heart. Given how close to each other we live ~ we really must get together someday and if over fine wine so much the better. I was so happy when Casting Crowns included it in their song, which also happens to be one of my favorite modern, Christian pop songs. Dinner and wine with you, anytime!